Chinese authorities have shut down an American-owned meat processor in Shanghai that was supplying several big name chains. 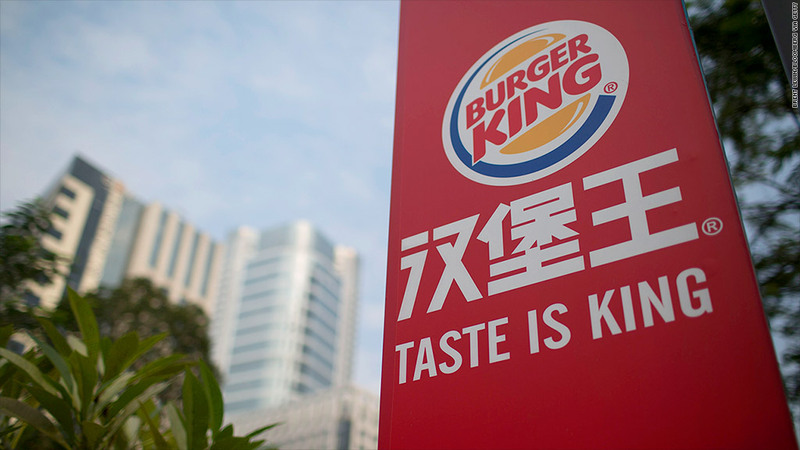 Burger King and Papa John's joined the list of companies caught up in a Chinese food scandal that has spread to Japan. On Monday, local regulators suspended the operations of Shanghai Husi Food, a subsidiary of Illinois-based OSI Group, and ordered all its meat products to be taken off shelves across Shanghai. The government intervened after a Chinese broadcaster aired footage of workers using their bare hands at a Husi food plant to process expired meat, and even food that had fallen on the floor. Burger King (BKW), Papa John's (PZZA) and Chinese fast food chain Dicos said they had taken down Husi-sourced products. McDonald's (MCD) and Yum Brands (YUM) have already apologized to customers and halted orders from Husi. McDonald's confirmed Tuesday that its restaurants in Japan were customers of Husi. They have stopped buying the meat processor's products. Yum said there may be temporary shortages of KFC's cheese pork hamburger and BBQ hamburger, and Pizza Hut's stone pan Texas flavor beef. Starbucks (SBUX) pulled its chicken apple sauce panini sandwich from some Chinese outlets, because its supplier purchased meat from Husi. Social media in China has been buzzing with lists of firms thought to be affected. Subway, Domino's (DPUKY), and TGI Friday's tried to reassure their customers, issuing statements to say they did not source from Husi. Ikea, which operates in-store food shops, said it had stopped buying from Husi in September 2013. Shares of Yum Brands tumbled 4.3% in U.S. trading on Monday. McDonald's which has over 2,000 stores in China, saw its stock drop 1.5%. Husi's parent, OSI, said in a statement that it was "appalled...[and] has zero tolerance for any actions that compromise food safety." Food safety has long been a top concern for China, affecting domestic and foreign companies. In 2008, a major scandal erupted over tainted infant formula that killed some babies and left thousands more ill. Earlier this year, Wal-Mart (WMT) recalled some donkey meat after it was found to be contaminated with fox meat. Yum Brands has just emerged from a food safety scandal that began in late 2012.